There is a plague that has infected higher education over the past decade. One that has been so invasive that it has changed the habits of teachers and the expectations of learners in ways that are quite profound, but have gone largely unnoticed. I am talking about the infestation of lectures with bullet points. It is a hobby-horse of mine, but I am sick of watching bullet points (especially when presenters think it is cool to have them zooming in from the side of the screen, one-by-one), and I regard it as a sickness among our colleagues that needs to be treated. Students have asked me if university teachers are instructed to read out bullet points during their lectures. I obviously say, ‘no’, to which the students reply, ‘so why do they do it?’. Everyone I speak to tells me that reading points to students in lectures is bad practice, and yet there appears to be a form of pedagogical paralysis that prevents some colleagues from breaking free of this affliction. There are a number of assumptions that I make in my mind (fairly or unfairly) about presentations that consist of nothing but bullet points. I assume that the presenter lacks the imagination to offer anything other than bullet points (the greasy-spoon mentality of ‘chips with everything’). I assume that the presenter is lazy, and cannot be bothered to present materials in a more engaging way. I assume that perhaps the presenter doesn’t know the content well enough to transform the content into a different format. I presume that the presenter has not been able to construct a coherent schema in his/her mind and so has to work with atomised chunks of content – whilst expecting me to generate some coherence from the presentation. For these reasons, I have all but given up going to keynote lectures at conferences. By the time I get to the third or fourth slide of bullet points I have switched off. And I am not alone. I make a point now of sitting near the back of the audience during these sessions; partly so that I can make a quick getaway if it gets too boring. But more interestingly, so that I can observe the audience to see what they are doing. From the speaker’s perspective, it often looks like the audience is engaged and they are busy typing down the pearls of wisdom on their laptops and tablets. From the back what you see is a sea of screens on which the audience are busy responding to their e-mails. I was sat in the audience of a keynote a few years ago next to a colleague who knew of my hatred of bullet points. Six slides in and we hadn’t seen anything but bullets. Then the presenter announced the next slide as “the triangle of research”. My ears pricked up and I looked at the screen in anticipation of a geometric depiction of said triangle. What did we get? Three bullet points. To which I said to my colleague, “where’s the triangle?”. His response, “I suppose we have to presume it is in his head – so I wonder who the slide is for?”. There are exceptions. There are presentations that have been really good. But there seems to be a correlation (at least in my mind) about the quality of the PowerPoint and the quality of the presentation. Some excellent presentations have used PowerPoint, but to show things that cannot be adequately summarised in bullets. Things like graphs, maps and photos. I have even been to presentations where PowerPoint has not been used at all. Imagine! Yes, it can be done. One of the best presentations I have been to recently used a single slide – an image that was the focus of the lecture. Also, colleagues need to remember that PowerPoint can be turned off for part of a presentation – just press ‘B’ on the keyboard and the screen will go black. I was recently unable to attend a presentation in London. One that sounded potentially very interesting and was to be led by the great and the good. Although in the end I couldn’t go, I was pleased that the organisers would send me copies of the presentations from the day. When the files arrived in my e-mail, I was eager to see what I had missed. Unfortunately, all I got was a lot of bullet points. From this I was unable to determine if there was any coherence or innovation in the ideas that had been presented. It was like seeing the chapter headings from a book. Useless! 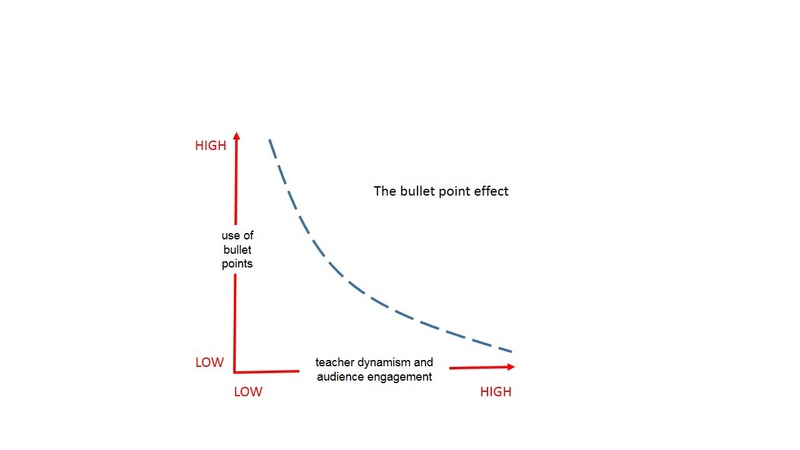 “STOP USING BULLET POINTS – THEY RESULT IN NON-LEARNING”. Perhaps next year, unless a cure is found in the meantime. Kinchin, I.M., Lygo-Baker, S. and Hay, D.B. (2008) Universities as centres of non-learning. Studies in Higher Education, 33(1): 89 – 103. Professor Ian Kinchin is Head of the Department of Higher Education at the University of Surrey, and is also a member of the SRHE Governing Council. This post was first published on Ian’s personal blog, https://profkinchinblog.wordpress.com and is reproduced here with the author’s permission. Categories: SRHE News Blog, Teaching Learning & Assessment | Tags: Bullet points, Higher Education, non-learning, teaching and learning | Permalink. The event was chaired by Student Experience Network co-convenor Camille Kandiko Howson with co-convenor Matthew Cheeseman in spiritu. These levels are then further compounded by levels of analysis, including individual, group (such as minority groups and international students), institutional (on topics such as governance, engagement and satisfaction), and inter/national (such as access, progression, labour market and rankings). Following the paradox of globalisation, and as countries around the world position higher education in society (such as dropping tuition fees in Germany and dramatically increasing them in the UK), what key issues about the student experience are of relevance across higher education research, beyond national politics and policies? What research questions are not being asked about the student experience? What research and evidence could promote productive, effective educational models of higher education? Across national contexts, the importance of measuring and researching learning strongly emerged. Several delegates raised troublesome issues when Western views of educational research and practice were used in other contexts. This encompassed staff and student perceptions of the learning environment and their relationship to each other, in terms of culturally-bound classroom and research practices. This highlighted power issues between staff and students, particularly the notion of students publically challenging or critiquing staff, even in confidential research settings. A fundamental question arose about different national and cultural interpretations of the concept of student voice, and the need for more comparative work about what student voice means in practice in different political contexts, inside and outside of the university setting. The challenges of borrowing, or imposing, Western views were also discussed in relation to methodologies, particularly the use of large-scale surveys. The US-based National Survey of Student Engagement offered both the opportunity for comparative research of student engagement and student learning using a validated tool but researchers noted that many of the underlying theories are culturally-bound, such as ‘ideal’ forms of engagement between staff and students and notions of democratic participation, particularly in non-Democratic settings. From East Asia to Africa to the Middle East, different perspectives and modes of interaction were discussed. Related methodological issues were challenges in translating English-based research resources into other languages and cultural settings. A useful framework picked up from conference presentations was that of using ‘powerful knowledge’ and ‘powerful understanding’ when crossing borders, using international methods and tools and in partnering with colleagues. This seminar concluded with a desire to share opportunities for collaboration and participation in exploring these areas of research. This entry is a start to this endeavour, welcoming comments and proposals for projects that could carried out in multiple national contexts and engage the international higher education research community. So please comment, share and get in touch with one another! Dr Camille Kandiko Howson is a research fellow at King’s College London and co-editor of The Global Student Experience: An International and Comparative Analysis. Douglass, J. A., Thomson, G., & Zhao, C. M. (2012). The learning outcomes race: the value of self-reported gains in large research universities. Higher Education, 64(3), 317-335. Staddon, E., & Standish, P. (2012). Improving the student experience. Journal of Philosophy of Education, 46(4), 631–648. UNITE (2014) Living and Learning in 2034- A higher education futures project, University Alliance and UNITE. Categories: Global Perspectives, Research, Society News, SRHE News Blog | Tags: effective educational models of higher education, Research questions student experience, SRHE conference 2014, Student experience, Student Experience Network | Permalink.